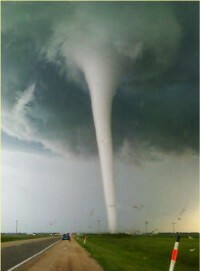 A tornado is defined as a violently rotating column of air extending from a thunderstorm to the ground. The most violent tornadoes are capable of tremendous destruction with wind speeds of 250 mph or more. Myth: Areas near rivers, lakes, and mountains are safe from tornadoes. Fact: No place is safe from tornadoes. In the late 1980's, a tornado swept through Yellowstone National Park leaving a path of destruction up and down a 10,000 ft. mountain. Myth: The low pressure with a tornado causes buildings to "explode" as the tornado passes overhead. Fact: Violent winds and debris slamming into buildings cause most structural damage. MYTH: Windows should be opened before a tornado approaches to equalize pressure and minimize damage. Fact: Opening windows allows damaging winds to enter the structure. Leave the windows alone; instead, immediately go to a safe place. Copyright© 2018 Isabella County, Michigan.